If you are visiting Russia any time soon, don’t be surprised if your TAXI comes in the form of a BRDM-2 Armored Military Vehicle. 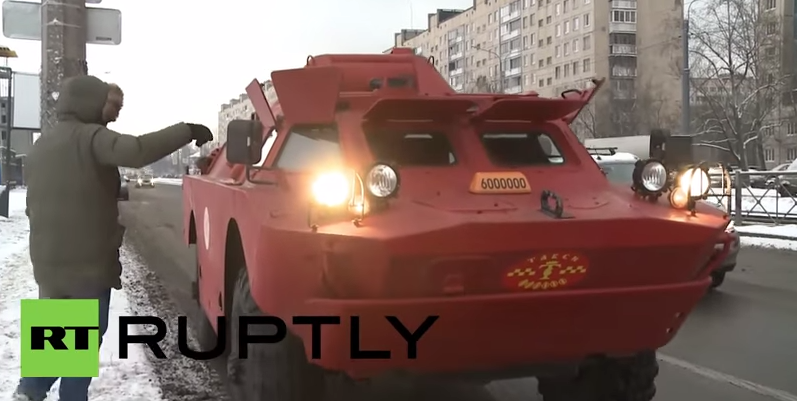 According to Russia Today, the BRDM APC (Combat Command and Reconnaissance Vehicle) fulfilled its role for the military and recently received a taxi permit in Saint Petersburg. The vehicle’s initial application to transform into a TAXI was refused, but after removing the camouflage pattern and painting the vehicle red, the application was later approved. It costs about $89, or 5,000 rubles, to catch in a ride in the BRDM-2, but because it can easily maneuver across any type of terrain and is amphibious, there is no where this beast of a TAXI can’t take passengers. Because the vehicle tips the scales at 17,416 lbs (7,900 kg), it has been banned from traveling on some of the historic streets in Russia. While the outside of the BRDM-2 looks aggressive, the inside features comfortable leather and electric windows for passengers. Not to mention, it is probably one of the safest TAXIs in the world thanks to 0.5 inches (14mm) of thick armor.